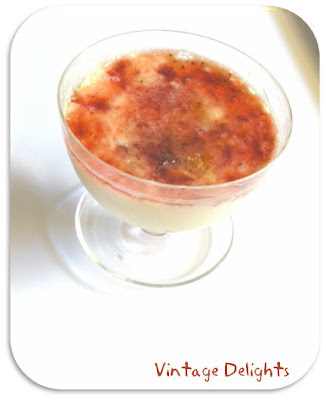 Vintage Delights by Adla Alhaddad: Strawberry Cream Cheese Pudding. Trifle Pudding :A trifle is a dessert made from thick cream,custard, fruit, sponge cake, fruit juice or, more recently, jelly. These ingredients are usually arranged in layers with fruit and sponge on the bottom, and custard and cream on top. Isn't it so often that you have leftover cakes that you don't know exactly what to do with them. I love my cakes fresh.. meaning baked and eaten on that same day. Left over cakes just aren't the same, they tend to loose their moisture if not kept in an airtight container and so on. So what I usually do in the event that I'm left with left over cakes is that I turn them into trifle puddings. I thought I'd share the recipe of my Strawberry Cream Cheese Trifle made with left over cake which take less than 10 mins to whisk together. 1.Lay the slices of cake in your individual pudding cups or in a trifle bowl . 2.Take 3 tablespoons of strawberry jam and stir it with a 1/4 cup of warm water. 3.You then soak the cake with the strawberry mixture. 4.Cover the layer of soaked cake with your preferred choice of berries. 6.Pour the cream mixture over the cake and berries and let it set in the fridge for an hour. 7.You then glaze the trifle pudding with strawberry jam and you know what to do next... dig in and enjoy, Bon Apetite'! I'm making it for dessert tonight...thanks for the recipe! Hope your Valentine's Day is rich!! !